Rediscover the almost forgotten legends from the prehistory of the English and of the Wuffings through an exploration of the surviving texts and fragments in Old English and related Germanic and Norse heroic literature. 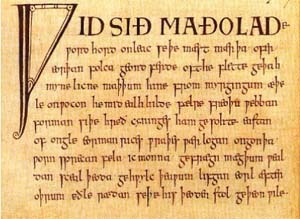 W e begin with a look at the epic which provides our best surviving window onto the Old English Heroic Age, Beowulf. Through this and related texts and manuscript fragments, especially the catalogue poem Widsith, we can glimpse the richness of the great word-hoard of heroic verse in early England and of the width of its historical and geographical scope. It becomes clear that much more such verse must have existed but has since been lost. We can partly map some this lost literature, however, through a consideration of comparative texts in other Germanic and Norse languages. We shall attempt thus to chart something of the legends and verse associated with the Goths and the Wuffings. Sam Newton was awarded his Ph.D in 1991 and his first book, The Origins of Beowulf was published in 1993. He is a Director of Wuffing Education and Time Team historian and has been researching, lecturing, and writing on Wuffing and Early Medieval Studies for many years. His latest book, The Reckoning of King Rædwald, was published in 2003.